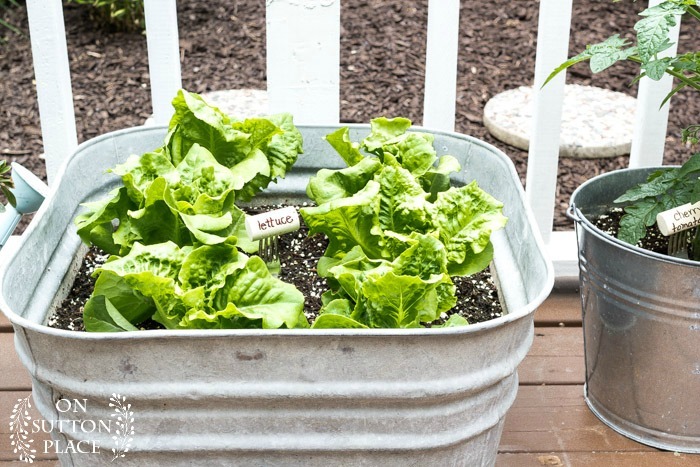 Easy Container Gardening with Vegetables and Herbs. 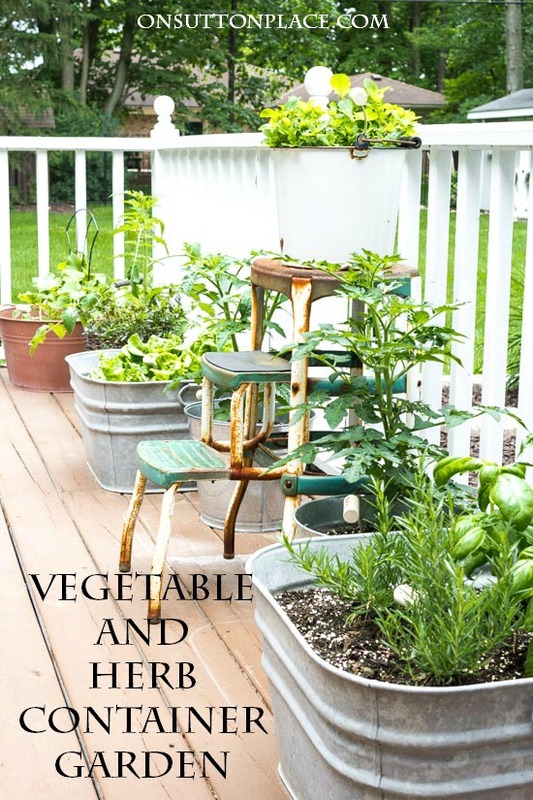 Includes tips for growing an herb garden in containers. Plant suggestions and more! Hello! I am so glad you are here because I actually accomplished something this week and I am very excited to share it with you. I did some easy container gardening with vegetables and herbs on the deck. It’s not anything over-the-top or even very special…but I started and finished it all in one week. I have not done that with any project for months. It felt really good to be outside and the time I spent in the dirt truly soothed my soul. I didn’t rush…I took my time but it was still finished in just a few hours. Anyone can do this…and here are my best tips. 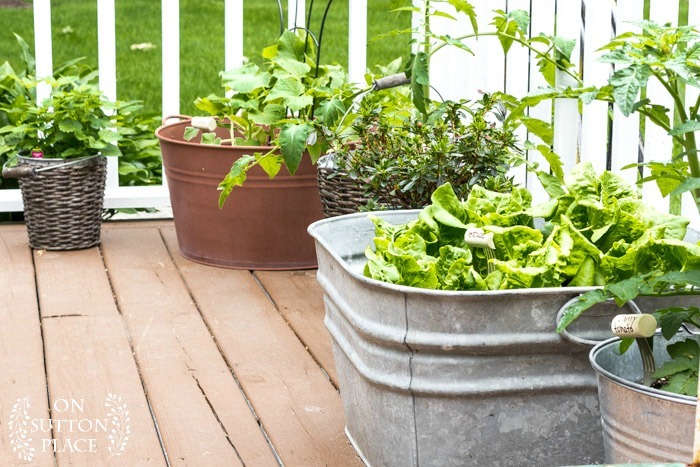 If you have any sort of patio, porch or deck, a container garden is perfect. You can make your garden as big or as little as you want. One pot or several…whatever you have room for. I haven’t purchased new containers for a few years. I just use old buckets and tubs. The first thing to do is gather your containers and make sure they have drainage holes. If not, you will need to drill holes on the bottom. If you don’t have any pots at all, check discount stores or home improvement stores. They have a great selection right now and some are very reasonably priced. Once you have your pots assembled, add fresh potting soil. I think it’s important to change the potting soil every year. Some years I have mixed new in with the old but the plants don’t seem to do as well. I bought two large bags and had plenty. I am really quite thrilled with the lettuce. I have been picking it for over a week and it’s so good. Of course I adore the mint and have been picking that as fast as it grows. The bush cucumber is in the copper tub. When I told my dad I planted a cucumber he seemed doubtful…so I hope I can share my abundant harvest with him! I added a small trellis but I’m not sure I really need it. Time will tell on that. The blue watering can holds a beautiful dark pink azalea. It was a gift from my All Things Creative team when my mom died. I’ll put in the ground in the fall. I’m not sure about the tomatoes. I have never had any luck growing them…either in the ground or in pots. I tried three different varieties so hopefully at least one of them will be successful. The basil and rosemary are already taking off. 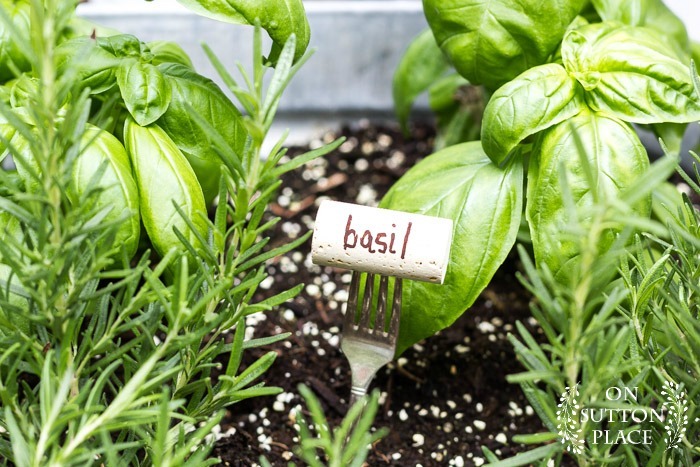 If you’ve never tried easy container gardening with herbs, these are the two to start with. They thrive anywhere and take very little care. I used an old, rusty step stool to add a little height. As you can see, my deck floor didn’t weather so well. It was given a fresh coat of stain just last summer but you would never know. * Affiliate links included. Click HERE for my complete disclosure statement. If you are wondering about the garden markers, they are simply wine corks stuck on forks. I wrote the herb names with a permanent marker. I picked up some vintage forks at my antique mall but of course, any forks will work. Before I put them outside, I gave them a coat of matte sealer. Thank you for stopping by…and for your support and friendship. I would love to get back to posting three times a week so that is my goal for the summer. I may or may not make it…but I am going to try. See you soon! 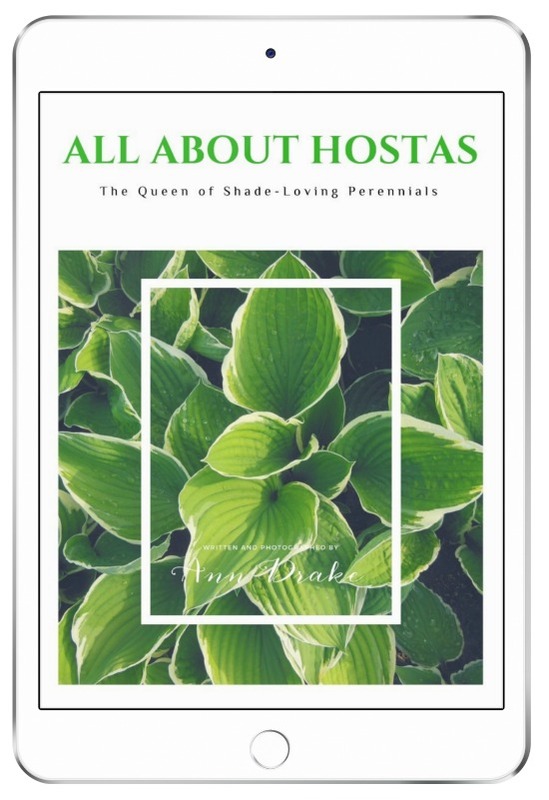 the All About Hostas eBook. I love your garden! I am pinning and will use this to help me make my own! Thanks for sharing at Dream. Create. Inspire. Link! I love your container garden! Using that vintage stool is such an awesome idea. Thanks for sharing with us at Merry Monday! Love the fork- cork idea. Your site rocks!???? Your garden looks gorgeous! Thanks for sharing your crafty inspiration on this week’s Monday Funday Party! Your garden looks awesome!! I too am an old container garden girl. 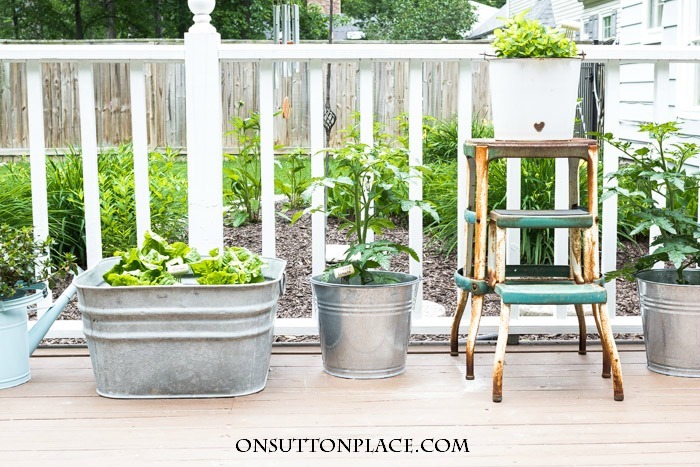 I love using some old galvanized tubs, buckets and enamel ware for my plants. And you are so right-being outside in the dirt is good for us. Thanks for the plant marker idea! 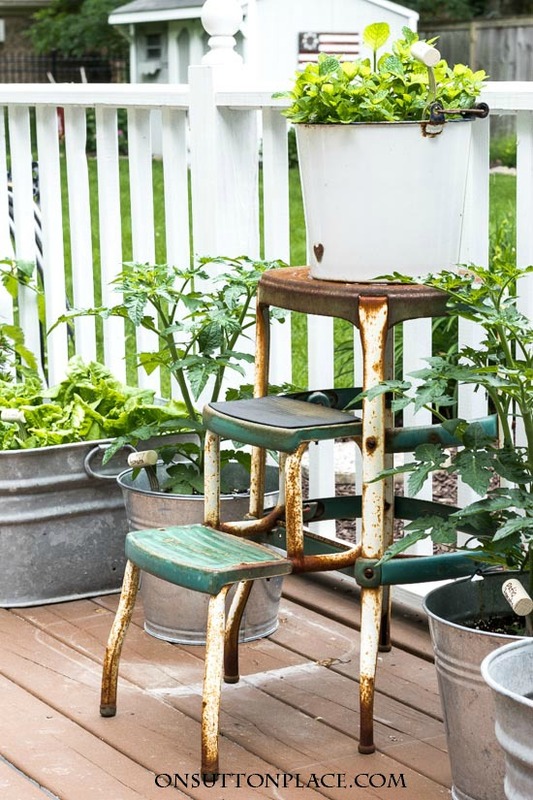 Love the old step stool! 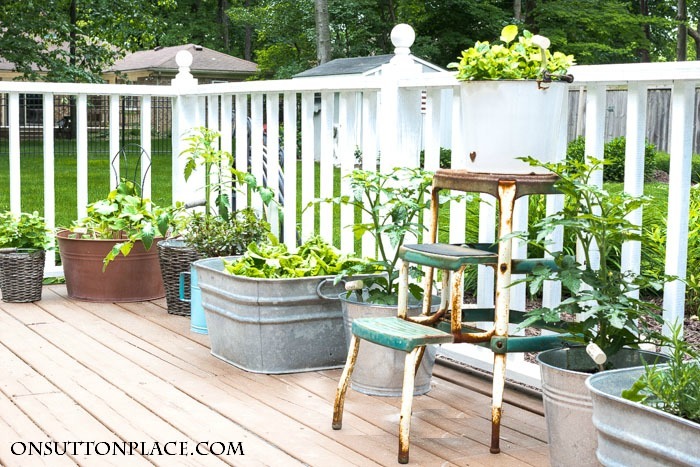 Your deck garden looks great! Ann, gardening is definitely therapeutic whether it is a large plot or a deck plantation!???? My mother is an avid gardener and always has been. She says it keeps her young, and at 86 she is the authority! She has a large garden that my brother helps her with. Mine is not so large, like yours, but I love it just the same. Good luck, Ann! All the best to you with your endeavor. Please keep us posted! I’ll be drinking some iced tea with orange mint while enjoying each and every one of your posts!! Growing and caring for plants is such good therapy. I find much rest and renewal just sitting in my little garden surrounded by growth. And, as you demonstrate, a garden need not be large or over the top to be a delight. I am making my garden by myself and no hip means no digging. Besides I also cannot bend well. Containers are perfect for me this year. Thanks. Your garden looks delicious. And so green. I am going to try some lettuce that way so I can move it to the shade. It is already so hot here. Popping over to your eBay blog for those cute little plant markers. Depends on what kind of cucumbers you planted … A lot of them need high trellis’s. I grow 3 different kinds. I have a bunch of the containers you do. Love them. Also use buckets from lowes and paint them. Walmart has a bunch of good ones also. Love your deck. You are after my heart. I have the same arrangement of herbs and veggies going but in a funky corner of our yard. After reading a comment now I’m wondering if I should move my tomato plants to a shadier spot or I could put up an umbrella which would be cute. Makes sense though. We have a neighbor that put up shade material over his garden and the plants do great. 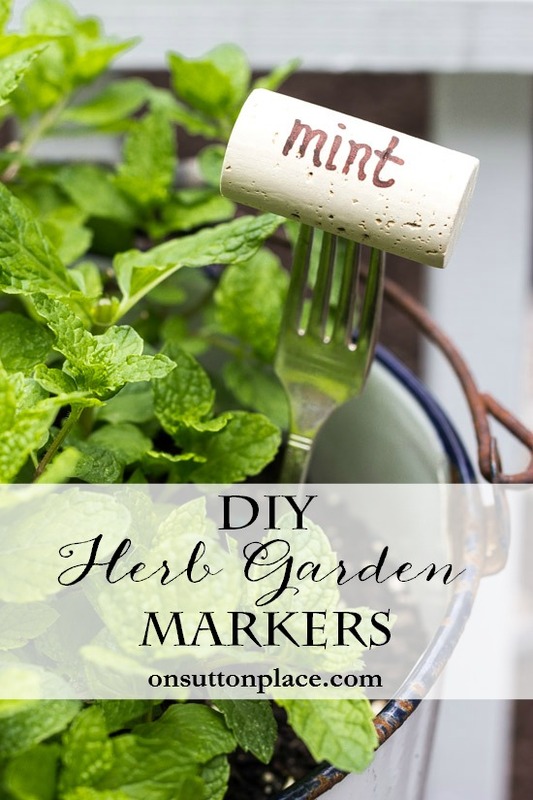 Love reading your blog, glad I found it, and I love the simple plant marker idea! Happy Sunday to you Ann:) My mom has several and with her using a walker with a seat, it’s accessible. Even pruning her butterfly bushes and hydrangeas. She is so happy to do that at this point ( had a large vegetable and flower garden ). My sister does the grunt work ( even misses that ). I’m visiting them now and tucking away every second with them. Your loss of your mom touched me deeply Ann. You can post once a week or three, no matter to me. I always enjoy your blog. Hi Maureen! I had to drill holes in the galvanized tubs. I drilled one large hole in each corner and they drain fine. The metal does dry out faster…but I’m used to watering almost every day and it only takes a minute. I have a hose right beside the deck. Hope this helps! We are just about out of sunny spots at our house. My hubby does have a small area where he has planted cucumber and 2 types of tomatoes. They’re doing well! 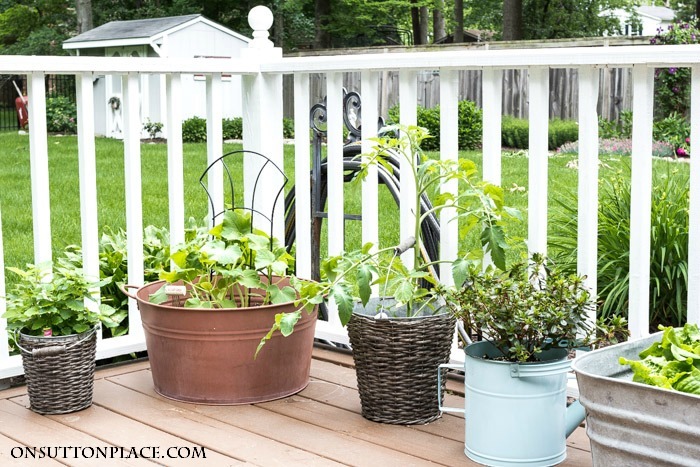 Ann, I love how you’ve done your deck gardening! Perfect! Oh! Your plant markers are adorable! I’ve never had any luck growing tomatoes either, Ann! Until one day my sister who lives in NC told me to put them under a tree. I know it’s sounds crazy, but the sun is to harsh on them. Since then, I’ve grown the best beefsteak tomatoes ever. Can’t wait to have my tomato, basil,mayo sandwich for lunch everyday! Good luck! I can hear your voice in writing that you’re pretty happy being outside and gardening! Everything looks so good and fresh!